After the recent elimination of Stephen Porter in 3rd, Cheryl Sloane and Zhi Wu agreed to chop up the $6,900 they were playing for, with Sloane taking $2,900, and Wu taking $4,000 and the trophy. Congratulations to Sloane on being the last woman standing and putting up a great fight, and congrats to Wu on his win! 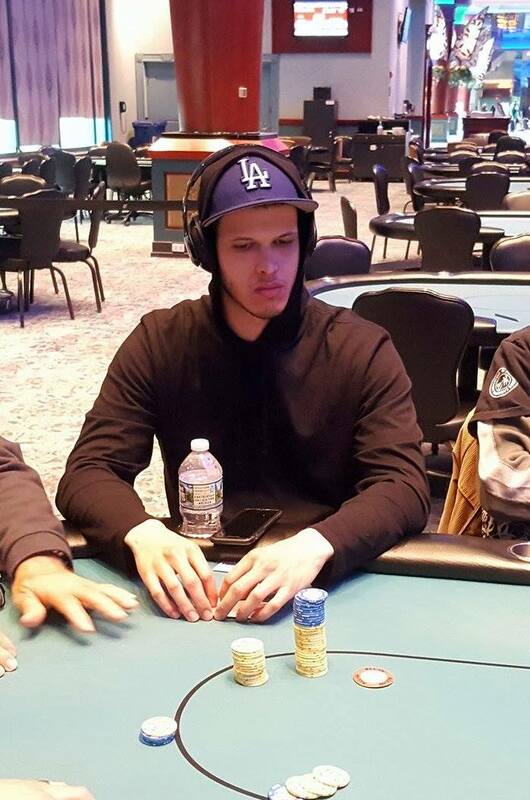 Stephen Porter was just eliminated from play in 3rd place. Porter shoved got it all in holding pocket sixes against Zi Wu's pocket fives. Wu flopped a set, and Porter was unable to improve. 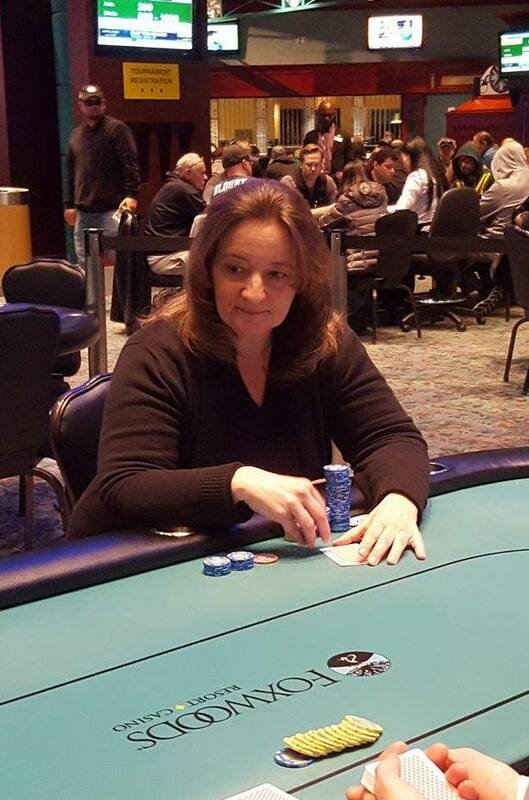 Cheryl Sloane was down to just five bigs a few hands ago but doubled up twice, and this hand, eliminated Kaplan from play. Kaplan shoved all in from the small blind with J♦8♣ and Sloane snap-called in the big blind holding K♦8♦. The flop ran out Q♠6♦3♥A♣6♥, eliminating Kaplan in 4th place. Carlo Sciannameo was just eliminated from play by Zhi Wu. According to Sciannameo, he raised to 125,000 on the button, Wu made it 350,000 in the big blind, Sciannameo shoved all in for 1,400,000, and Wu called. Wu flopped a flush, and Sciannameo was unable to improve. 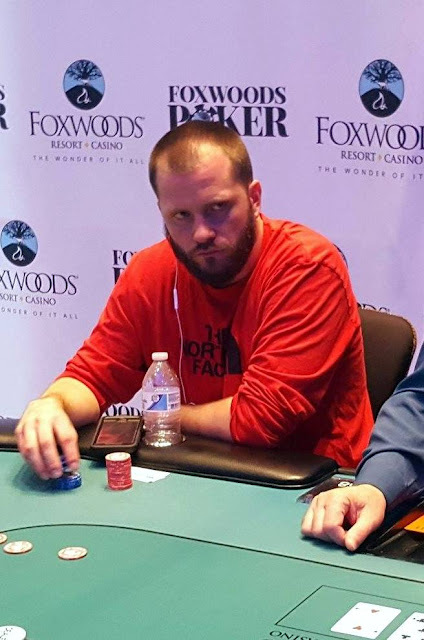 He was eliminated in 5th place, taking home $10,000 after the 8-way chop deal. On a board reading 7♣5♣3♥, Daniel Bunker got it all in holding 4♦2♠ for a straight draw, and Zhi Wu called holding A♣5♥ for a pair of fives. The A♦ on the turn gave Wu two pair, but gave Bunker in the lead when he made a straight. 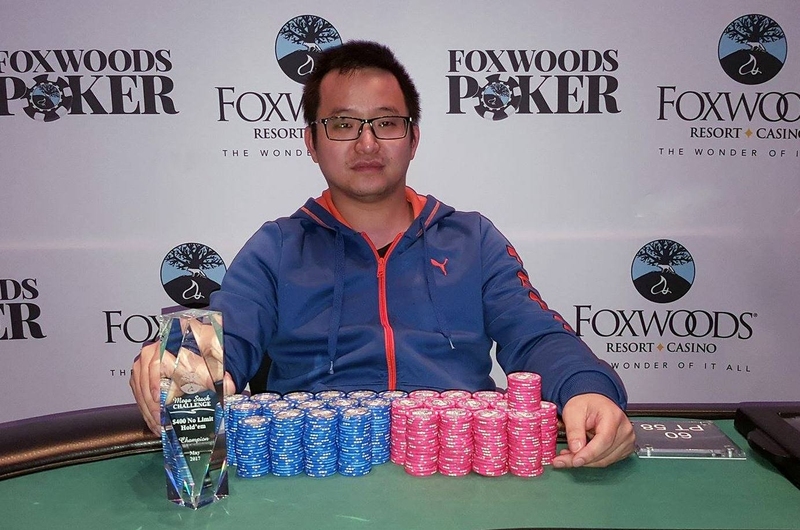 But the 5♠ on the river gave Wu a full house, and Bunker was eliminated in 6th place, taking home $10,0000 after the nine-way chop deal was made a few levels ago. Adam Lewis was all in from the small blind and was called by Daniel Bunker in the big blind, and Andy Kaplan in middle position. The flop came A♣J♦9♥. Bunker checked, Kaplan bet 125,000, and Bunker quickly folded. "I am toast," Lewis said as he turned over K♣6♥. Kaplan was indeed ahead holding A♥J♣ for top two pair. The 4♣ turn and 4♠ river did not improve Lewis' hand, and he was eliminated in 7th place, taking home $10,000 after the nine-way chop deal they reached earlier in the evening. With the board reading 7♠5♠3♦, Nick Harrison shoves all in from the hijack for around 300,000. Carlo Sciannameo reshoves over the top for around 1,800,000, and Adam Lewis calls all in for less in the big blind. Sciannameo is in the lead with his pair threes (and nut flush draw). The turn is the 5♣, and river the 6♦ giving Lewis a straight to more than double up, and eliminate Harrison in 8th place. 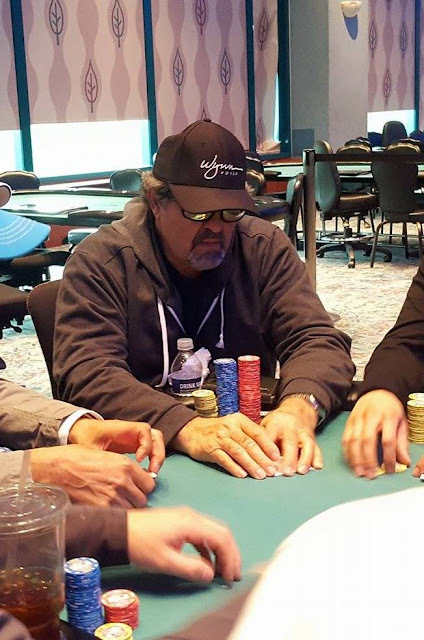 Frankie Flowers shoves all in for around 250,000 in the hijack, and Stephen Porter calls in the big blind. The board runs out J♠9♥7♥9♦5♠, awarding the pot to Porter, and eliminating Flowers in 9th place. He will take home $10,000 after the nine way chop deal. There were a total of 178 entries in today's $300 No-Limit Hold'em Big Stack event, generating a prizepool of $44,892. The top 21 places will make the money, with first place taking home $11,336. They will each take the money listed below, and then play for the trophy and the extra $6,900. James Boynton is all in holding K♠J♠ against Zhi Wu holding A♥A♦. The board runs out J♣9♣7♠8♥5♣, awarding Wu the pot, and eliminating Boynton from play. 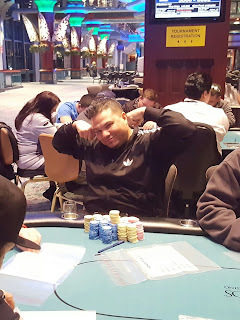 Ifran Krajic shoves all in for around 70,000 from utg, and James Boynton calls in the big blind. 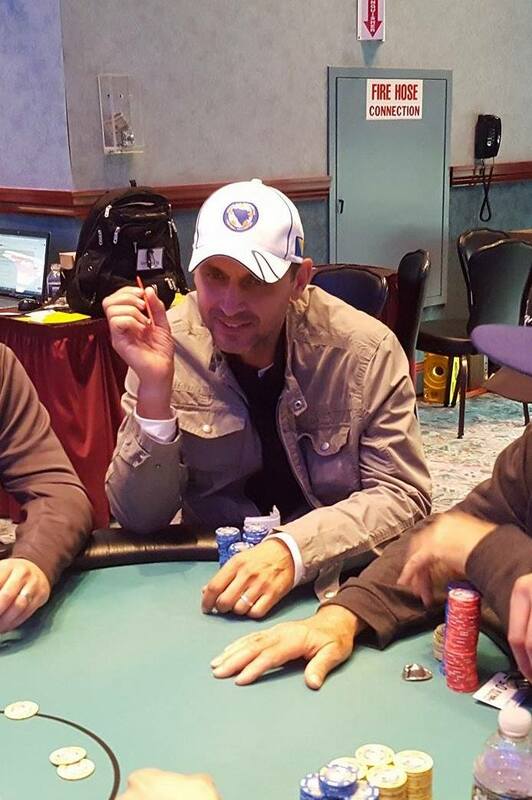 "Nice," says Karajic, "Nine," he calls for on the turn. But it's the 7♣ that arrives on the turn, giving Boynton a full house. "Ohhh," Karajic says with a frowny face. The river is the K♣, and the players all shake Karajic's hand congratulating him on a great run. The final 11 players are now on a 60 minute dinner break. They will return to play Level 26 with 15,000/30,000 blinds and a 5,000 ante. The average stack for the 11 players is 741,8181. Frankie Flowers shoves all in from under the gun for 237,000. It folds around to chip leader Carlo Sciannameo in the big blind who quickly calls. There is a queen in the window when the flop comes Q♥5♣2♣, giving Flowers the lead with a pair of queens, and causing Sciannameo to say, "Of course." The 6♣ turn and J♥ river are also safe for Flowers, and he doubles up just shortly before the scheduled dinner break. On a flop reading A♥7♠4♥, John Caputo and Cherly Sloane get it all in with Caputo holding A♦K♣ against Sloane's A♣Q♥. Caputo is ahead, but only until the turn comes the Q♠ giving Sloane two pair to take the lead. The river is the 2♦, and after a close count of chips, it's determined that Sloane has Caputo covered, and he is eliminated from play. Cheryl Sloane is all in and has been called by Carl Diveglia II. Sloane is ahead holding 9♥9♣ against Diveglia's 8♥8♣. The board runs out A♣10♦6♠9♠2♣, safe for Sloane to double up. 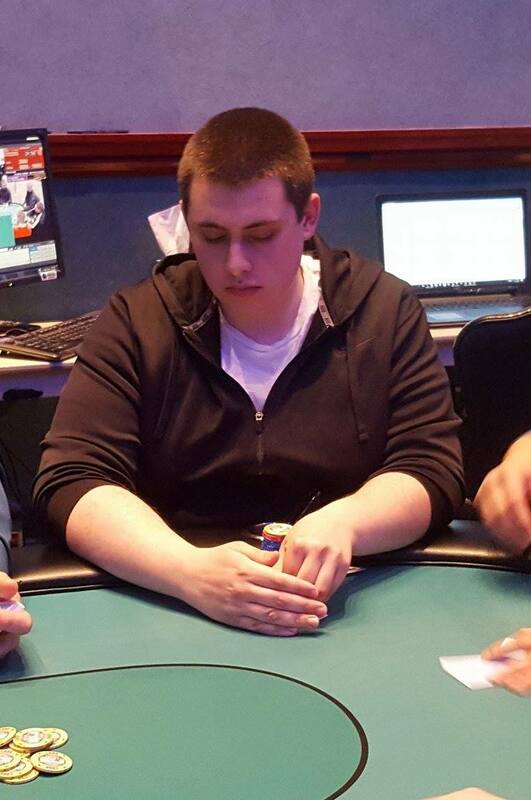 Daniel Bunker limped in from under the gun, and it folds around to Derek Peluso who shoves all in for 39,000 from the button. Zhi Wu calls in the small blind, Andy Kaplan calls in the big blind, and Bunker calls as well. Wu, Kaplan, and Bunker check it down as the board runs out Q♣7♦6♦10♠4♦. "Pair of eights," Bunker says as he shows his pair of eights. "Flush," Kaplan quickly says as he turns over Q♦3♦. "I needed your eight," Wu says as he shows 10♥9♥. Peluso quickly mucks without showing, and the pot is pushed over to Kaplan. Thomas Renault is all in on the button for 165,000, and has been called by Adam Lewis in the big blind. The board runs out A♠7♦6♦2♣10♣, awarding Lewis the pot, and eliminating Renault in 15th place. 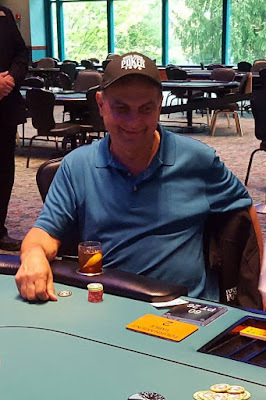 Facing a raise from Andy Kaplan in late position, Bill Logan moves all in for around 200,000 in the small blind. The big blind folds, and Kaplan calls. The board runs out 6♣3♣2♣7♠5♥, and Logan is eliminated from play. "How many times have you gotten those today?" a player at the table asks Kaplan, referring to pocket kings. "Three times today," Kaplan responds as the pot is pushed over to him. 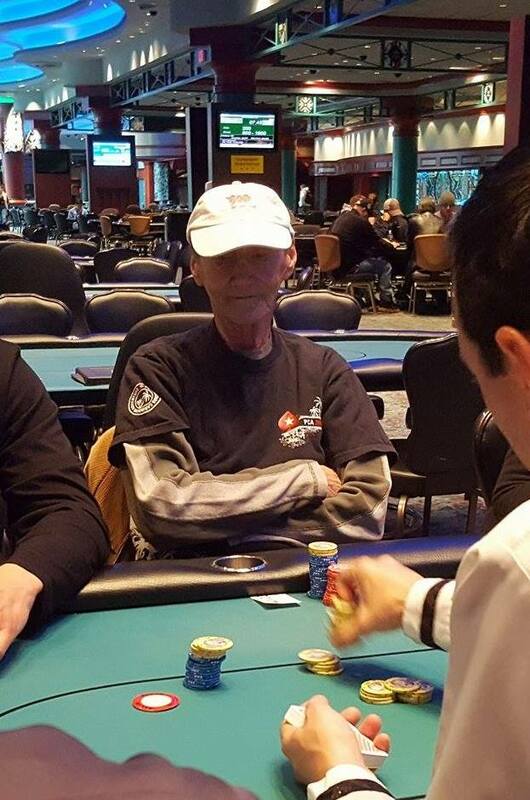 Bill Logan shoves all in on the button for 74,000. The small blind folds, and John Caputo calls in the big blind. 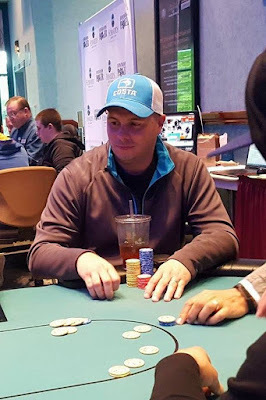 The board runs out 8♣8♥6♣J♦9♠, causing Caputo to say, "Almost a straight." There's around 100,000 in the middle, and the board reads 7♠7♣2♠. The player on the button is all in, Zhi Wu has checked in middle position, and Endi Leka has bet 60,000 in the hijack. With action back on Wu, he announces that he is all in, and Leka asks for a count. Upon hearing the 152,000 total, Leka pauses for nearly a minute before calling. The Q♣ turn and K♥ river do not change the outcome of the hand, and the button is eliminated, while Wu more than doubles up. 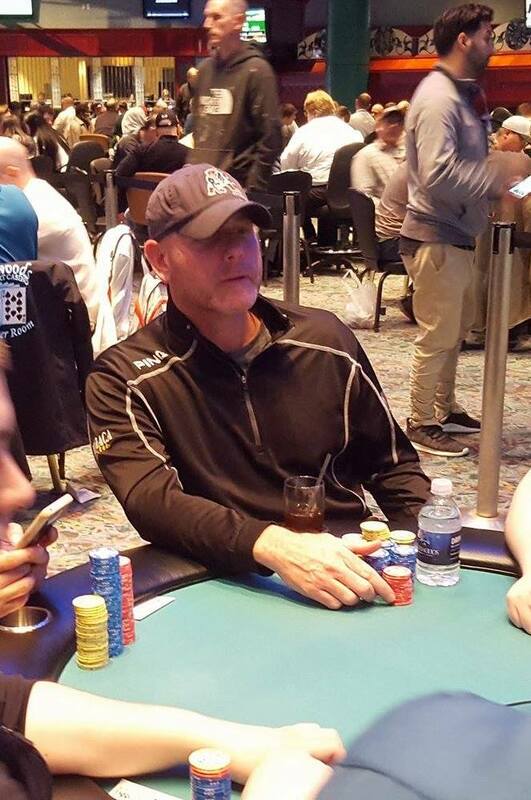 Andy Kaplan shoves all in from early position for 131,000. It folds to Frankie Flowers in the small blind who raises to 300,000, and the big blind quickly folds. The flop comes Q♦7♦5♣, leaving Flowers in the lead with his pair of jacks, but giving Kaplan a flush draw. The 8♥ turn is safe for Flowers, but the 4♦ river gives Kaplan the flush to double up. Artime Zhuta shoves all in for around 70,000 in middle position. It folds to Frankie Flowers in the big blind, and Flowers pauses. After nearly a minute and a half, Flowers moves chips forward to call. The flop comes 9♠3♠2♣, giving Zhuta the lead with a pair of threes. He increases that lead when the turn comes the 9♥ giving him two pair. But the 4♥ on the river gives Flowers a straight to eliminate Zhuta in 30th place. Zhuta crumples up his media identification card, says, "On the river," and walks away to the payout desk. After Zhuta walks away a player not involved in the hand says, "I mean, he did get it in bad." Flowers was the first player over the million chip mark, and is now sitting with 1,225,000. Players are now on their first 15 minute break of the day. They will return to play Level 20 with 3,000/6,000 blinds and a 1,000 ante. There are 34 players remaining, and the average stack upon return from the break will be 240,000. Event # 8, Day 2 - Raj Patel Has "Nine Lives"
Raj Patel has had a very up and down morning so far. He lost a large chunk of his stack very early on, and has been slowly doubling up a few times over to build back. This hand, Patel shoves all in from under the gun for around 25,000. It folds around to Zhi Wu in the big blind who pauses for a few seconds before opting to call. The flop comes Q♥10♣3♠ giving Patel the lead with a pair of tens. The A♠ maintains that lead and gives him flush outs. 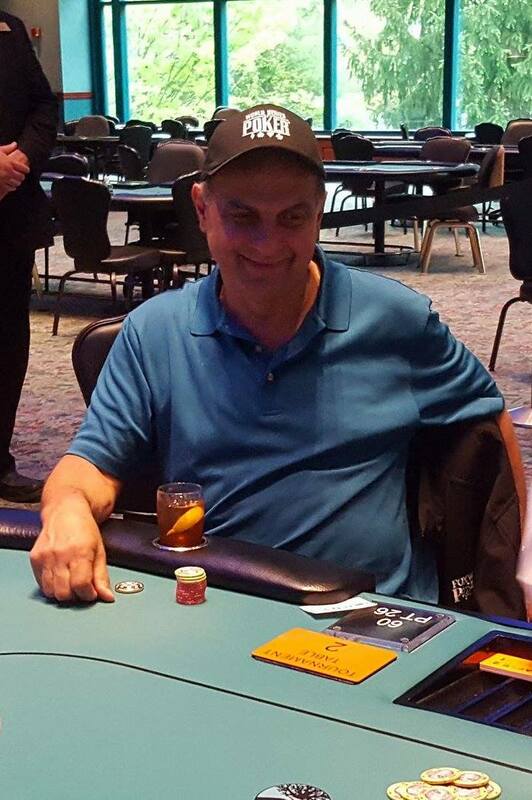 "Ace," Patel calls for, and the river comes the A♣. Patel doubles up and says, "I have nine lives, and I have used three of them so far." A full schedule of all May 2017 Foxwoods Mega Stacks events can be found HERE. 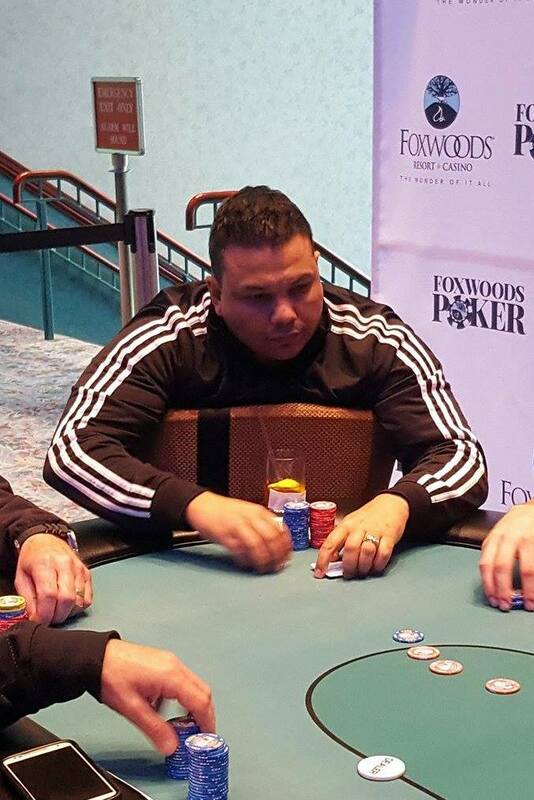 A full schedule of all Foxwoods Poker Tournaments, including daily tourneys can be found HERE. The money bubble has burst, and the final 15 players are bagging up their chips for the night. A full list of advancing players will be posted within the next half hour, and Day 2 seat assignments will be posted in the next few hours, as soon as they are available. We are still hand for hand on the money bubble, and Frankie Flowers is the massive chip leader. Flowers has been in the top three stacks for nearly the entire flight, but really pushed ahead of the pack a few from the money, climbing from 300k to 700k. He's now sitting with 750,000. 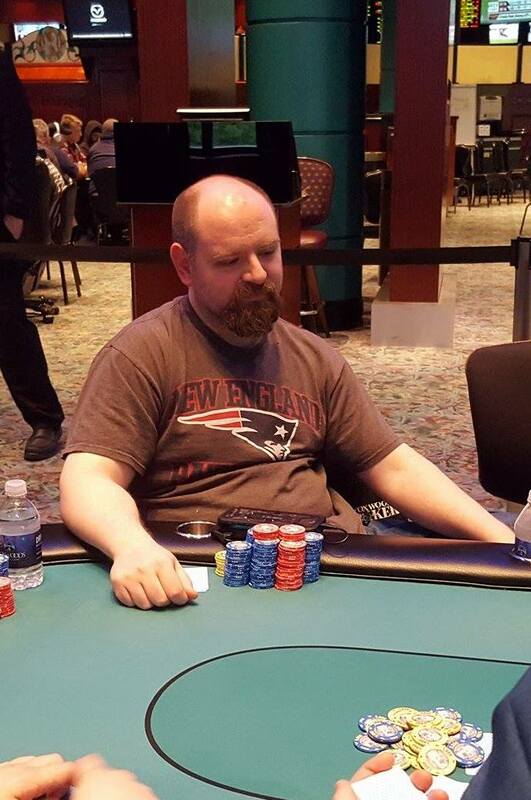 The next largest stack in the field appears to be 210,000 belonging to Carlo Scianmameo. There are 16 players remaining, with 15 of them making the money. The hand for hand portion of play will continue until we have lost one player. The final 15 players will then bag up for the night, and return to play Day 2 tomorrow (Monday May 15th) at 12:00 noon.